In a post a a week or so ago, I mentioned the 4 things I learned on my own about skincare that my dermatologist never told me. 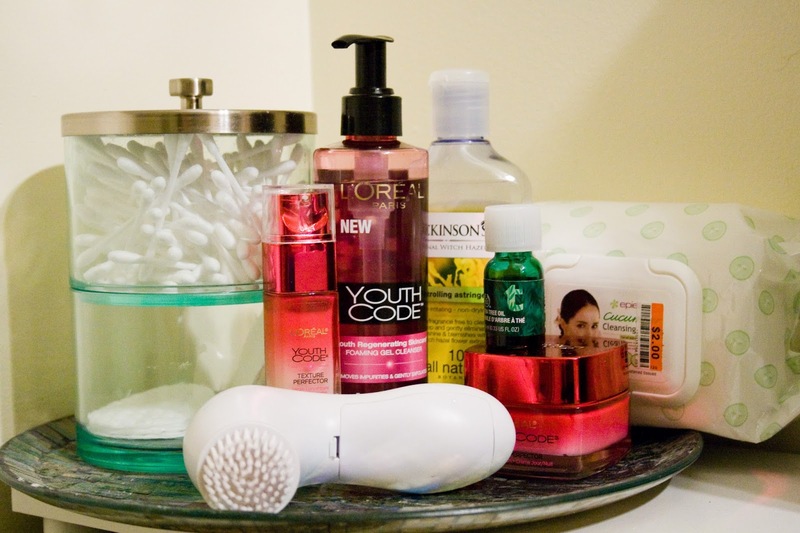 I've also posted about my skin care routine before and about the oil cleansing method. Now that I've discovered that consistency really helps with my skin I wanted to go further into how I go about taking care of my skin. 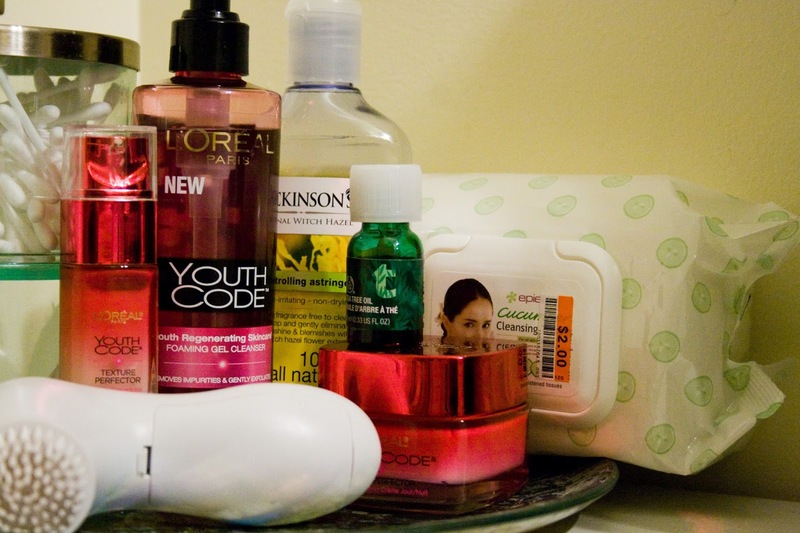 So this post is about my current routine here at the beginning of 2014. I think I've found some things I really, really do like (holy grail products maybe) that I don't think will change but maybe I add or subtract things as I go a long. I'm all for trying new things! These wipes are super, super cheap but amazingly awesome. (You can read more about my experience with make up wipes in this post). I love these because they are on $2 for 60 towelettes. The towelettes are damp enough for me but a little too thin so sometimes I need to use two. Since they are so cheap I also keep some by my vanity to wipe off my hand/fingers if I have make up on them. The ones I use have cucumber, aloe, & green tea so they don't make my face feel tight or sticky as some other wipes can. In the morning I use these wipes just to get the excess oils off my face. If I'm in a rush I use these wipes as the sole cleansing in the morning. Each afternoon/night I use these wipes to get all of my make up off before I wash my face. Sometimes I'll come immediately home & wipe off my make up. Then I'll cleanse my face a little bit later. Getting all my make up off before I cleanse my face means that I'm getting everything off & the cleanser can do it's work. The single step of cleansing just gets your make up off but doesn't do anything for your skin beneath. I make sure to get all the make up off - these wipes are so cheap I can use two & not feel bad about it. I love this little cleanser because it goes with the other products I have in my skin care routine. I've mentioned this before as well, but I love trying a line of products not just products here and there. The best example of this is my review/use of the Olay Fresh Effects line. I feel that a whole line of products should go together & not compete with each other and I felt the Fresh Effects line did (read about that here). So, I picked up this cleanser to go a long with the other Youth Code items in my routine. I love that it foams & I do feel very clean after. It leaves a slight cooling feeling so I feel it's good for calming my skin*. However I would not suggest using this around your eyes to remove make up, just don't. This cleanser claims to be exfoliating. There are no beads in this gel cleanser so I thought one of the ingredients must be a chemical or ezymatic exfoliant. In a quick search I found that the ingredient Capryloyl Salicylic Acid is in fact an exfoliant. I only use this cleanser as a quick little manual cleanse & not with the cleansing brush I use at night. It's not overly drying & great to start the day. However, sometimes I skip it & just wipe off my face with the make up remover towelettes. Whether I'm at the sink or in the shower I do a lot of dirty work with this bad boy with my cleansing brush. This cleanser claims to exfoliate so I usually focus on cleansing my face for longer with my cleansing brush. In the shower the hot water opens my pores & I feel I get a great clean pairing this cleanser with my CVS brand cleansing brush. This cleansing brush is amazing and I love using it. I switched from using an acne cleanser everyday because I felt like I no longer needed it. I guess since I just moved into my late twenties it's time to start focusing on anti aging & not acne! This is a gentle & natural toner that I love using. I really like it because it tones naturally and I don't have to add more chemicals to my face. Now I know I use a lot of other things that have chemicals but this makes me feel a little bit better. It also just makes my skin feel natural. Sometimes toners can make my skin feel oily or dry and I want to restore the PH in my skin not coat it in something crazy. I was skeptical about the product at first after trying just the Dickinson's Witch Hazel - I felt that did nothing for my skin. But this one claims to help pores - not that I've noticed - and is specifically a toner not just witch hazel. So far I like it. After I wipe or cleanse my face in the morning I dampen a cotton pad & sweep it all over my face. It feels nice, that's it. After I cleanse my face in the evening I use this as a secondary residue remover but also to tone my skin. I love that it tones with out drying. For me this is the first step in hydrating my skin since this really brings it back to normal. I used to use an over the counter spot treatment with benzoyl peroxide or what have you & I had a love hate relationship with them. Usually they'd do what they were supposed to but some would make my face swell up or make me itchy. Also none of them did the overnight reducing that they all claimed. I finally surrendered & picked up some Tea Tree oil in Ulta while I was home for Christmas. Boy, I'm never going back to anything else. It really reduces the redness & inflammation and it soothes. Man, oh man I just love it. Unless I have a crazy breakout happening I don't use the tea tree oil in the morning. Usually I just let it sit on my face overnight. It's not irritating at all so I could put it on during the day but sometimes I feel like my breakouts get a little too dry during the day if I use it because it keeps treating. The tea tree oil I have is already diluted, don't apply straight up tea tree oil to your face FYI! This is when I use the oil the most. After cleansing & toning I dampen the end of a q-tip and dot it on all of my breakouts. Sometimes I sweep it over larger areas but I try to concentrated on the actual zit. If I need more oil I flip the q-tip over & dampen the other side so I'm not contaminating anything with the bacteria from my face. I use this little serum from the drugstore that claims to minimize pores, improve skin's texture, & even out uneven skin tone**. I first heard of this on YouTube & thought why the heck not. After trying just the serum I was hooked on this line. While I don't know any science behind this & many of the claims are based off of consumer self assessment**, I still think this product works. Personally I've seen a reduction in my uneven skin & better pores. I don't believe you can do anything to make your pores actually smaller but I've noticed just an overall firmness in my skin that I think really helps with pore visibility. Again, consumer self assessment here! In the morning I usually just use this as a moisturizer unless my skin is really dry. This serum does have a luminosity factor to it - if you look at the product after you've dispensed it onto your hand you can see a little iridescence - so using both this & the day/night cream is often too much for my oily skin. But since it's the winter this is step on of moisturizing morning & night. I pair this with the Day/Night cream mentioned below because I feel like this serum really does the dirty work & the Day/Night Cream does the moisturizing. This adds a little bit of moisture but it has a thin consistency so I like to pair it with something thicker. This little jar adds the final step to moisturizing. I feel that the day/night cream doesn't do any of the dirty work that the serum does it just offers more moisture though the website gives the same claims to the cream as the serum. Again after using this paired with the cleanser & the serum, I've noticed results. I've noticed the texture & tone of my skin improve most drastically. If my skin is feeling extra dry I'll use this after the serum in the morning. Usually on the weekends I'll do this step too just for a little more hydration. Even though this can be a bit to heavy for my skin I have noticed that the shine I get through the day from the oily nature of my skin is more glow & less gross. I don't look like my make up is dissolving I just look healthy - does that make sense? For added hydration I always use this in the evening. Keeps my skin happy with moisture so I don't get overly oily during the day - I just develop a healthy glow. I know that sounds gross but sometimes make up can make you look flat where as developing a natural glow gives you some depth. And that is it! The ends & outs of my skincare routine for the beginning of 2014. I think that as we move into warmer weather something is going to change. I believe I liked the natural moisture that coconut oil gave to my skin in the summer - not too heavy & just right - so I imagine I'll go back to it once the extra hydration isn't needed for my skin any more! How do you care for your skin? Any products to recommend? *I read that menthol is derived from peppermint oil that can irritate the skin, sadly I did not save this link. But I did find more info on menthol in cosmetics here. ** Claims taken from L'Oreal website here.